Originally published: New York: Hyperion Books for Children, 2007. 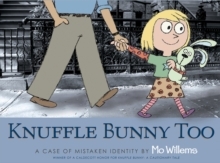 The hilarious second instalment in the Knuffle Bunny trilogy from bestselling, award-winning author Mo Willems. In the hilarious second instalment in the Knuffle Bunny trilogy from bestselling, award-winning author Mo Willems, Trixie can't wait to show off her one-of-a-kind Knuffle Bunny at school. But a dreadful surprise awaits ... Trixie's bunny is not so one-of-a-kind after all! And matters get worse that night when Trixie realizes that she has brought home the WRONG BUNNY!